“Threads” made from a common suture material are inserted under the skin. The threads have small “cones” that grip the tissue and hold it in place as the threads are positioned to achieve a natural, lifted contour that gives the more youthful appearance. Over time collagen forms to help support the new contour while the threads and cones dissolve like other internal sutures. Before | After: Six months post-treatment. 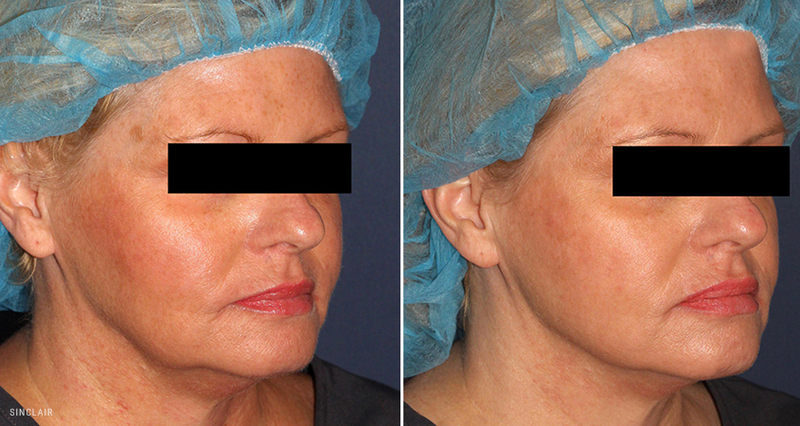 This patient received three threads on each side of the face to lift and re-contour. Silhouette Instalift is FDA cleared and has an excellent safety profile. The procedure is performed with topical anesthetic, so the risks of general anesthesia and IV sedation are avoided. As with any treatment, there are some risks associated with the procedure, and patients for whom the treatment not recommended. Patients with known allergies to suture material or foreign body sensitivities, and those with active infections in the insertion area should not have the procedure. Dr. Cox will review risks, benefits and contraindications with you during the consult, and help you decide if this is appropriate for you. No “recovery” period is necessary, but you’ll want to modify your behavior for the first few weeks. Immediately after the procedure, three micro-incisions for each thread will be covered with small steri-strip bandages for 2-3 days. You’ll want to sleep face up for 3-5 nights, avoid any high impact sports for 2 weeks, and stay out of the sauna and away from the dentist for 3 weeks. Dr. Cox will review these and other minor changes in behavior with you to ensure you get, and keep, the best results possible. The lifting effect from Silhouette Instalift is immediate. Over time, collagen will build in the treatment area, improving results. You will continue to see results for up to 18 months. Silhouette Instalift is not a face-lift, and Dr. Cox will let you know if that’s a better option. Our goal is to provide the information you need to make an informed decision about what’s best for you.